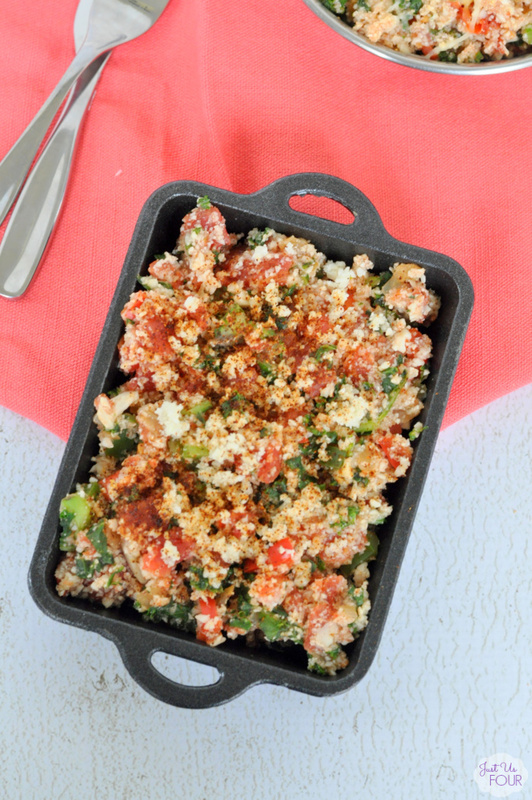 This starts with cauliflower rice and then gets a ton of flavor added in from diced tomatoes, chili powder and a few other Mexican flavors. It all gets toss together and baked in the oven for a few minutes for a perfect, family friendly dinner in almost no time. 1) To make the enchilada sauce: Heat coconut oil over medium heat. Stir in flour and chili powder. Cook for one minute. Add chicken stock, tomato paste, oregano and cumin. Bring to a boil. Reduce heat and simmer for 20-25 minutes, stirring occasionally, until thickened. Let cool slightly. 2) Preheat oven to 375 degrees. Lightly oil a 9×9 baking dish. 3) Using food processor, rice the cauliflower. Transfer to paper towels and squeeze out excess water. Place in large bowl. 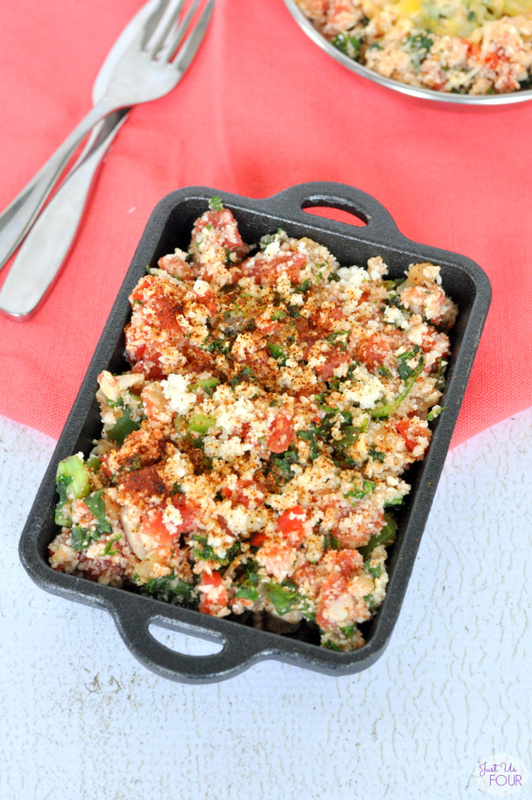 4) Add kale, tomatoes, jalapeno, 2 tsp cumin and 1/2 tsp chili powder to boil. Stir to combine. Stir in 1/2 cup cooled enchilada sauce. Transfer to baking dish. Sprinkle with remaining chili powder. 5) Bake in preheated oven for 10-15 minutes or until heated through. Everyone loved this dish! It was the perfect substitute for traditional enchiladas. This version is all vegetables but you could easily toss in some shredded chicken or ground beef for some extra protein. The non-Paleo eaters in my house asked for some cheese so I sprinkled some on top during the last 5 minutes of cooking. Mathlete said it made it taste more like enchiladas in his mind so he would be requesting it that way all the time. It is an easy addition! To make the enchilada sauce: Heat coconut oil over medium heat. Stir in flour and chili powder. Cook for one minute. Add chicken stock, tomato paste, oregano and cumin. Bring to a boil. Reduce heat and simmer for 20-25 minutes, stirring occasionally, until thickened. Let cool slightly. Preheat oven to 375 degrees. Lightly oil a 9x9" baking dish. Using food processor, rice the cauliflower. Transfer to paper towels and squeeze out excess water. Place in large bowl. Add kale, tomatoes, jalapeno, 2 tsp cumin and 1/2 tsp chili powder to boil. Stir to combine. Stir in 1/2 cup cooled enchilada sauce. Transfer to baking dish. Sprinkle with remaining chili powder. Bake in preheated oven for 10-15 minutes or until heated through. The enchilada sauce can be made ahead and kept in the refrigerator for several days until ready to use. I made this tonight with three changes – I used spinach because I hand it already, I seasoned my sauce and the cauliflower mixture with quite a bit of salt, and I topped with shredded cheddar. It’s a good side dish, but could be a main dish if served as taco filling with a little sour cream, cilantro, and onion. 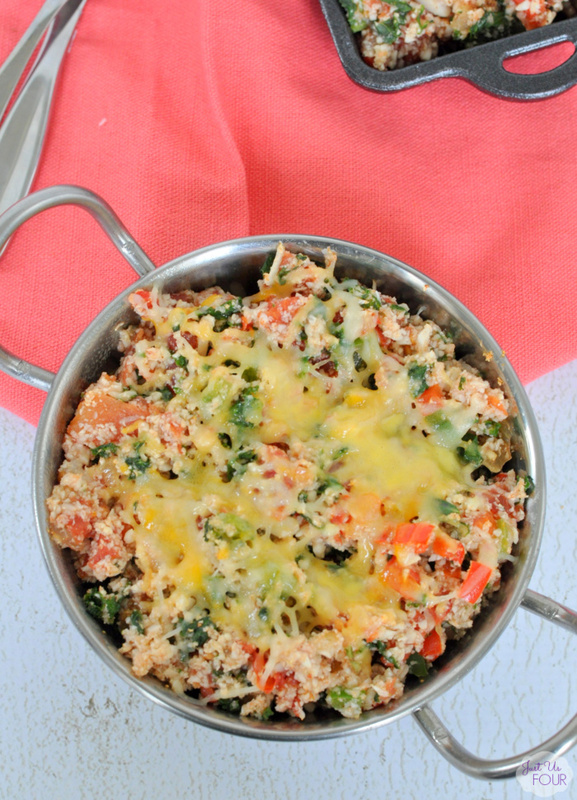 Great ideas to add spinach and cheese! I definitely think anything involving cauliflower rice always needs additional salt.